Packed with spiritual insight into the nature of consciousness. 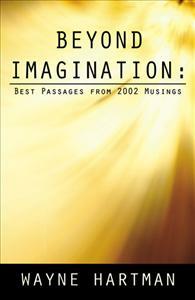 This book is a collection of the best passages from the Musings of a Spiritual Warrior from 2002. With the exception of mid October through November, the musings came forth daily. The musings are stream of consciousness expressions. They are spiritual works that come from the depths of my being. I share them in the hope that they will help to awaken something within you, that we may jointly go about the business of co-creating the foundations of a new world in which spirit can more fully express in flesh.